Bengaluru: First ever FIBA recognized Pro Basketball League in India 3x3 Basketball league enters the fifth round on August 11-12 in Phoenix MarketCity Bengaluru. 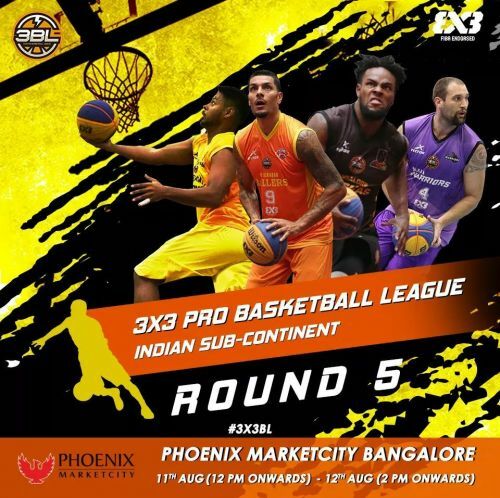 After an exciting fourth round in Chennai, 3x3 Pro Basketball League moves to Bengaluru for the fifth round of the league at the Phoenix Market city. 3x3 Pro Basketball League gained so much of Popularity in India and the excitement for the league increased and the league also provide an incredible opportunity to the Indian Basketball players. Venue: Phoenix MarketCity Whitefield Bengaluru. Date: August 11 from 12 pm Onwards. August 12 from 2 pm Onwards. Benagluru Machas consists of Parker Rivera, Chethan, Sowkin and Karan beat the favourites of the league Delhi Hoopers consists of Inderbir Gill, Kiran Shastri, Harkirat and Dhruv by 21-20 in the sensational and eye-catching match in the Chennai and Benagaluru Machas emerged as Champions of the fourth round of the league. Timajh Parker Rivera of Bengaluru Machas become the new Most Valuable Player (MVP) of the fourth round of the league in Chennai.Timajh Parker-Rivera and Chethan Suresh created a powerful inside-outside duo against Delhi Hoopers in the final match of the Chennai round and increased their chances of emerging on the top in the inaugural season. Delhi Hoopers represented India in FIBA 3x3 World Tour Masters in the Japanese city of Utsunomiya. but unfortunately, Delhi Hoopers team lost both matches in the Group Stage to the top seed Liman of Serbia and Okayama of Japan in a small margin. Bengalurur Machas are looking forward to winning the fifth round in Bengaluru as they became favourite in their home city after being crowned as Champions in Chennai and The current standings have Delhi Hoopers in the first place, followed by Ahmedabad Wingers and Bangalore Machas.